Are you looking for the best practices how to buy property and how to create a property purchase agreement? Then for sure, you need to download this Property Purchase agreement template now! This Property Purchase and Sale Agreement template covers the most important subjects and will help you to structure and communicate in a professional way between the Property seller and the Property buyer. In the event of material loss of or damage to the Property prior to the date upon which Buyer assumes the risk, Seller shall not be obligated to restore the Property nor pay damages to Buyer by reason of such loss or damage, and Buyer may terminate this Agreement by giving notice of such termination to Seller and Closing Agent, and such termination shall be effective and the Deposit shall be refunded ten (10) days thereafter provided, however, that such termination shall not be effective if Seller agrees in writing within such ten (10) day period to restore the Property substantially to its present condition by the closing date and provided further that Buyer may elect to purchase the Property in the condition existing on the date of closing and on closing Seller shall assign to Buyer the proceeds of any policy of insurance carried by or for the benefit of Seller covering any loss or damage to the Property occurring after the date hereof and prior to the closing date.. In addition to other representations herein, Seller represents and warrants to Buyer as of the date of closing that. 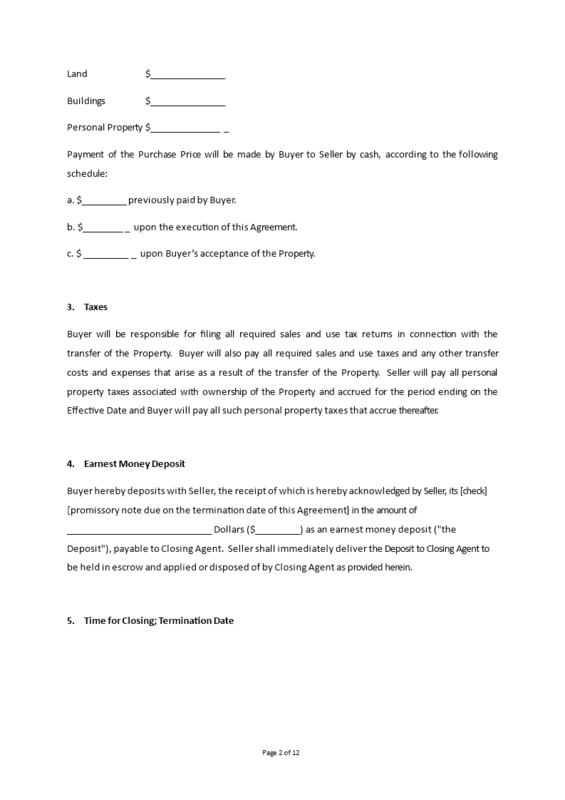 Download this Property Real Estate Purchase Agreement template, fill-In the blanks, print ...done! Using this Property Purchase Agreement templates guarantees you will save time, cost and efforts and helps you to be more successful!